Most people facing end-of-life decisions want to die in their own homes, prompting a call for more support for home-based care services as the population ages. Source: The Advertiser. A national report on the issue, commissioned by Catholic Health Australia, found up to 70 per cent of people would prefer to die at home. However, only about 14 per cent actually do, compared with about 42 per cent in the UK. The report draws on the experiences of more than 9,400 palliative care patients admitted to its 80 member hospitals each year. 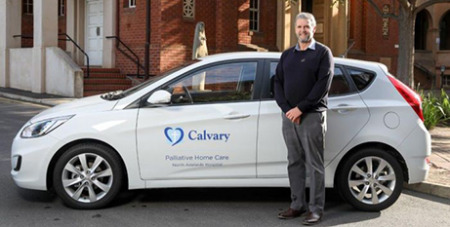 The report was launched yesterday at Calvary North Adelaide Hospital, which is the first private hospital in South Australia to introduce home-based palliative care services. More than 50 patients and their families have used the service since it began last September, based on the patients having appropriate support networks at home. The service, backed by private health insurance funds, includes 24/7 access to palliative care telephone support and visits from nursing and allied health practitioners to assist patients and families. CHA chief executive Suzanne Greenwood said the projected growth of Australia’s ageing population meant significantly more people would need access to high-quality end-of-life and palliative care services in the coming years. “Our ageing population is increasing up to 22 per cent per year,” she said. Calvary Palliative Home Care Service manager Kevin Hardy said a goal of palliative care was to give people a choice, which for many was to stay in their home. “The significance of giving patients this choice can’t be understated, particularly at a time in their lives when many choices are taken away from them,” he said.